A new TV series produced by LaDiDa Media wants to help you and the picky eater in your family. -Do you have a five or six-year-old who refuses to eat certain foods? -Is the dinnertable becoming a battle of wills instead of a family gathering? -Is the worry about your picky eater causing stress for your family? Karen LeBillon is bringing her book Getting to Yum to the TV screen (www.GettingtoYum.com). And she wants to meet your family, and share her simple steps for turning even the most picky eater, into a fan of healthy and diverse foods. If you live in the lower mainland and would like your family to be a part of this new TV series, contact them. They're looking for families with one picky eater of around 6 years old, who are available for to film in their home for one day on the weekend of June 7th and 8th, and for one day of the weekend of June 14th and 15th. They're also hoping to film a follow up to check back with your family in July or August. Have Parents & Children Lost Their Ability to Sign-Off? Saturday night, my wife and I watched The Conjuring (Honey, I apologize for the bruises. Digging my nails into your thigh did offer me some comfort). Other than a cellar which left a lasting fear I haven't experienced since, at twelve-years-old, I read Stephen King's "The Shining", one image stays with me two days after the viewing. The movie takes place in the early 70's. One scene shows a researcher asleep at his desk at 3am. 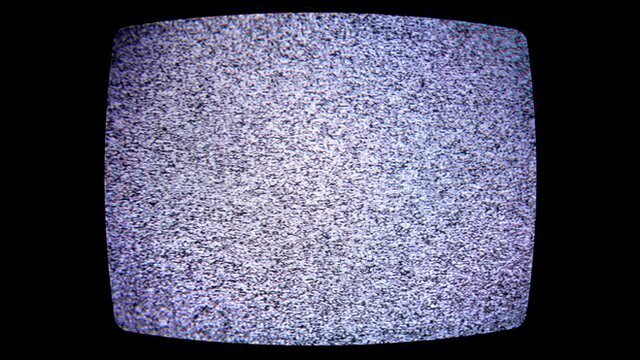 In the background, the television shows nothing but static. The station had signed off. Remember those decades? That era of broadcasting when networks decided nightly they had nothing left to show you? Often they would play the national anthem as a music bed, over which they would display a montage mountains and cities, animals and farmers, and mountain peaks and plains. Then? Good night. We've got nothing left. Long before MTV disguised a series of acoustic performances as novel ideology ("Look! It's Eric Clapton playing without electricity! "...apart from the amps for his instruments and the beautiful lightshow. ), 'Unplugged' is what we would all become at some point during the day. There was simply nothing left to accomplish after bedtime. As a child, I remember my parents not answering calls during the supper hour. The green rotary telephone would hang from the wall ringing uselessly, attempting to annoy us out of our chairs. Now? Dinner time has become the best time to reach Mom or Dad (just ask telemarketers). With our responsibilities to the office, to our children's schools, to their extra-curricular activities, to their homework, etc, 5:30pm-6:30pm has now become a favorite target of the "Sorry to bother you, but..." conversation. At the very least, call display has become a spatula, prying us from the dining area to satisfy our curiosity about who may be calling us during supper: "I'll just go see who it is..."
Whether it's our residential phone line (for those among us dinosaurs who still have one)--or our cell phones, or our children's cell phones--we are being notified into oblivion. Yes, they can be turned off, but that curiosity, that need to know is more persistent...("I wonder if he responded...", "I wonder if that post got any hits...", "I just have to let work know about..."). More and more schoolwork is being done online (many schools, including my own children's, have instituted iPad programmes (another windfall of money and ideology for the Mac family). Digital homework is certainly more alluring than that of the pencil sharpening variety. But, encouraging our children's digital growth produces a need to patrol and contain their digital curiosity. "Only your homework, nothing more." "Okay, if you're done, turn it off." "Honey, that's not a toy, let your brother do his homework." Parents often negotiate more time with their children (and with each other). The new currency is a promise not to sign-off. While being reachable through cells phones and emails may allow more physical freedoms, psychologically we end up being wirelessly tethered to external responsibilities for longer periods--often through the dinner hour and into the evening. It is not freedom from obligation. Rather, it's more freedom to maneuver by way of an extended leash. One theory I've put into practice is to deliberately extend my wait period before I return a phone call or an email. I do this to lower the sender's expectations. I do it also to teach myself to have a more sensible definition of what is urgent. So far, it's working beautifully. With a buffer built into my response time, I feel more confident ignoring phone calls and emails and notifications. I still hear my phone buzz and beep and vibrate. I still twitch (a fascinating autonomic response--as though my body needs me to go check my messages). But evenings are slowly becoming my own. After all, if a 1970's demonologist with a family's life hanging in the balance can be undisturbed by a television which offers nothing, surely I, too, can conjure some peace and quiet. How connected are you to your electronics? Do you have "sign-off" rules? P.S. Richard S: Thank you for suggesting that movie. I'm never speaking to you again. On my most recent appearance on Breakfast Television Montreal, I sat down with Joanne Vrakas to talk about those mistakes we parents just can help making when we're tired, stressed and busy. Turning decision-making into a democracy at the worst possible moments. Discussing parenting strategy with your spouse in front of your kids. Being too busy to take those extra five minutes with your kids.